The everyday stories. The things that we tell each other over a drink or at the evening dinner. The little anecdotes that we experience. Those were always too small to reach the media save in drips and drabs. The disease of the week. The consumer advocacy tale. The plucky little kid that started a bottle drive. The elderly gent blowing out the candles on his hundredth birthday. But really they were just fillers. Noise to fill the air between commercial breaks because not every day was an “oh the humanity” day. These stories and happenings would be just memories to the few people who witnessed, and those witnesses may share the tale when the context was right or when trying themselves to fill the time with a prior more interesting event. And once you’ve relayed the tale to those that you know and they’d heard it once, twice, a dozen times too many, it would simply become a memory. And then it would be gone. Take a moment to watch this video. And then read Heather Skye’s own words recounting the event. And then finally watch this last video. The advent of digital media and the ability to distribute it through social channels is freeing these stories from their temporal and geographical and anecdotal limitations. You did not need to be in Houston last weekend in order to catch this particular moment. You did not have to be a friend of one of the people, and happen to have mentioned Star Trek or X-Men, sparking the “did I tell you about the time I saw Sir Patrick Stewart” story. I caught this tale on Facebook, from a friend Mike Wood. Mike had seen the story on Gawker and posted it. The author of the post on Gawker picked it up from GeekoSystem. None of these people were in Houston this weekend and none of them are friends of Heather. But the author on GeekoSystem found the YouTube video, shot by Oswald Vinueza and posted by Heather. Through that video and Eugene Lee’s photos and Heather’s words the moment was preserved. People opine about the disconnection that our devices and networks create. People talk about living the life through the viewscreen of a smartphone or tablet instead of in the moment. Would they really choose the world in which these were words and moments that none of us would have had the opportunity to share in? Too small for the evening news and unlikely for Heather’s words to find their way into any magazine or paper. Trapped in the minds and photo albums of the few who happened to have been there in that room, at that moment. Would they be happier for these moments to be transient experiences, fleeting and then gone? The people who tweet and instagram and film and live blog and check-in or status update aren’t missing out on the moment. They are preserving it and sharing it and making it more than just a memory. I think that Heather’s life is better for having been able to share the moment from that book launch from 2009. 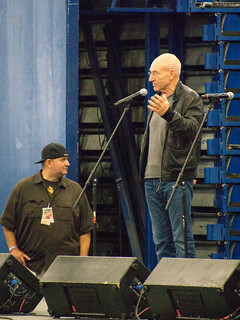 I know that I’m glad to have been able to share in Heather’s moment with Sir Patrick Stewart. I hope that you’re all enriched a little bit from my having shared these moments and that you go on to share across your own platforms and networks. Thanks to social media we are all of us unstuck in time and space and able to experience this together whether it was before, or now, or still to come. Are You Pole Dancing in the Graveyard? Don’t Blow Your Budget On Measurement on The ROI of Measurement: What’s That Information Worth to You? Keeping Communication Measurement On-Budget - The Elusive Fish on The ROI of Measurement: What’s That Information Worth to You?